Review: Shrek ends up in a Far Far away land where there isn’t such a thing as Shreks. Rumpelstiltskin reigns in this unknown world to Shrek. Really surprised with this film. I really enjoyed it! I am always worried about sequels to films that they are never as good as the original. 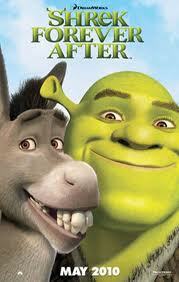 I just hope that they don’t do a Shrek 5. This series is on Barry Norman’s list of 100 Greatest Films of all time that he produced at the start of 2012 in the Radio Times.